Southern’s Student Marketing Club (SUMA Marketing) recently placed among the semi-finalists at the prestigious International Collegiate Case Study competition after developing a comprehensive campaign for an ecommerce giant. Each fall, the American Marketing Association hosts the Collegiate Case Competition for its 370 student chapters around the world. Every year, a different company sponsor provides the chapters with a marketing problem that they are prompted to solve through a comprehensive 40-page marketing plan. 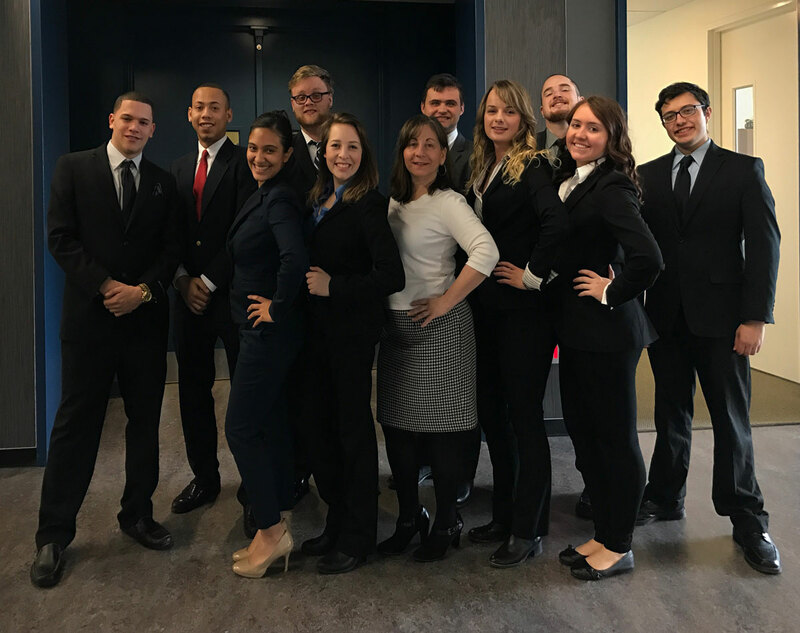 “This was the first time that an ecommerce company (eBay) was used as a case study, so for our students, this was great experience in digital marketing,” said Randye Spina, assistant professor of marketing and faculty advisor to SUMA. The challenge was to increase eBay’s participation in the online trading marketplace by Millennial and Generation Z non-users. Listed as one of the most valuable brands in the world with more than $8 billion in revenue in 2015 and with an estimated 164 million active buyers as of the second quarter of 2016, eBay is facing an increasingly crowded and competitive market with competition from rivals such as Amazon, Alibaba, craigslist, and Etsy. To address the challenge, SUMA collected primary and secondary market research, devised a marketing strategy, and created an integrated marketing communication plan with creative marketing tactics — all within the sponsor’s provided budget. From data collected through 186 completed surveys of commuter and resident students “we learned that many young adults think of eBay as their parents’ website, while theirs is Amazon,” said SUMA Marketing President Julia Rotella. The resulting annual plan for July 2017 through August 2018 saw Southern’s team placed among the top 20 competing colleges, when results were announced in January. This year, for the first time, due to the complexity and difficulty of the project, the AMA Case Study was run as a three-credit course (MKT 398). Past Southern entries were based solely on club activities, Spina said. SUMA (SCSU Undergraduate Marketing Association) is Southern’s collegiate chapter of the American Marketing Association. SUMA provides members with marketing and professional experience through national competitions, fundraising, community service, and much more. For more information visit: owlconnect.southernct.edu/organization/sumamarketing. American Marketing Association student membership and AMA collegiate chapter affiliation offers many benefits, from career resources, platforms for professional development and experiential learning, execution of chapter events, leadership development, to taking part in the many AMA competitions offered annually. For more information visit: ama.org/collegiate. Trip to Italia - Ciao Bella!